Male house sparrow, Passer domesticus. This bird is an invasive species that has been introduced throughout much of the world, where it is dependent upon the presence of humans. Image: Josie Galbraith. Feeding wild birds is a hugely popular pastime worldwide. But this is essentially a massive global supplementary feeding experiment with ecological effects that are poorly understood. A newly-published study of bird feeding in New Zealand reports that the common practice of feeding bread and seed alters the species composition observed in urban bird communities such that introduced bird species were the big winners at the expense of native birds. The study suggests that supplementary feeding of bread and seed encourages higher densities of introduced bird species, which may in turn, decrease local populations of native bird species. Bird feeding is certainly one of the most universally popular hobbies in the world. For example, according to a 2006 US Fish and Wildlife Report: “Over 55 million Americans over the age of 16 feed wild birds and spend more than $3 billion a year on bird food, and $800 million a year on bird feeders, bird baths, bird houses and other bird feeding accessories.” In a 2002 report, the Department of the Environment, Food and Rural Affairs (DEFRA) estimated that more than 60 percent of UK households with a garden feed wild birds, and a British Trust for Ornithology (BTO) study analysed data collected during the winter of 2002-2003 by the Garden Bird Feeding Survey, a citizen science project, and reports that 60,000 tonnes of food are presented annually to birds (Glue, 2006). Considering its tremendous popularity with the public, it might surprise you to learn that feeding wild birds is controversial, particularly amongst ecologists and birders. Much of this controversy is based on assumptions and handwaving since very few scientific investigations into this practice have been published. Basically, the only thing that most scientists can be sure of is that the global scale of bird feeding probably does affect wild bird populations, but no one knows precisely what those effects might be. A team of scientists from New Zealand and Australia, led by Josie Galbraith, a doctoral candidate in the School of Biological Sciences at the University of Auckland, wanted to know if bird feeding might increase the capacity of urban areas to support birds, thereby enhancing the overall biodiversity of cities. Considering the dietary divide between native and introduced birds living in urban New Zealand, the team predicted that the typical grain-based feeding practices followed the public would increase densities of introduced species at the expense of the more specialised native species. How do typical bird feeding practices affect native vs. introduced species? 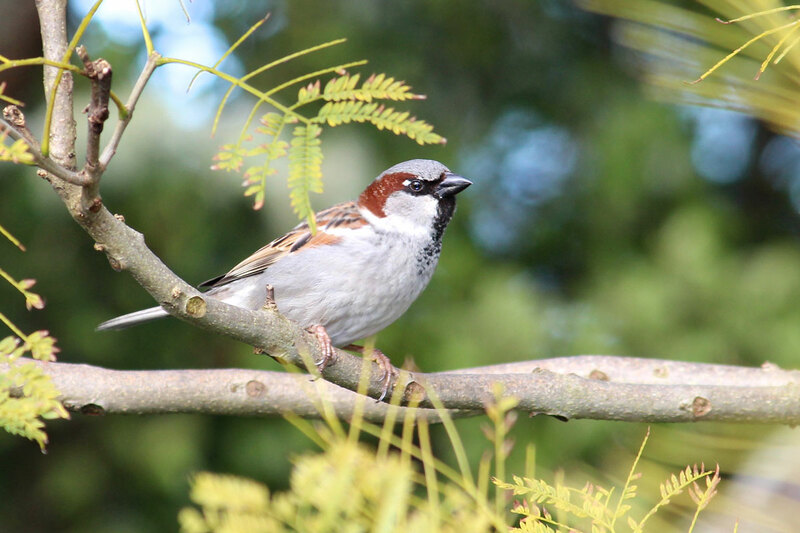 To address this question, the team surveyed wild birds that visited bird feeders placed in the gardens of 23 urban homes in northern Auckland. Eleven of the 23 homeowners provided bird food whilst the other 12 other sites provided no bird food. Every morning during the 18 month study period, homeowners fed birds the two most common foods items offered by New Zealanders who feed birds; pieces of bread and “budgie seed mix”. 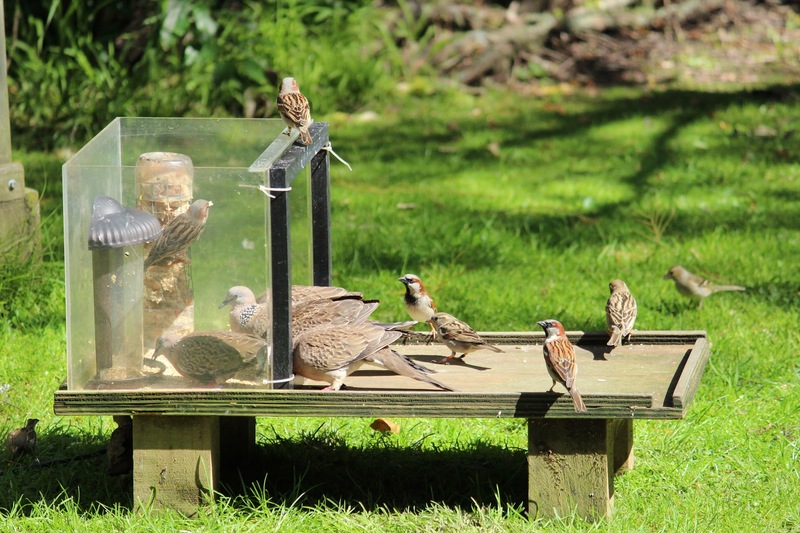 Figure 2: Spotted doves, Streptopelia chinensis, and house sparrows, Passer domesticus, crowding together at an experimental feeding station. These species are invasive and are not native to New Zealand. Photograph: Josie Galbraith. During this time, 597 surveys (10-minute point counts) were conducted where all birds that were either seen or heard were recorded. A total of 18,228 birds of 33 species were recorded; 16 of which were native species and 17 were introduced. The most commonly observed birds were house sparrows (Passer domesticus; 96.6% of surveys), Eurasian blackbirds (Turdus merula; 91.1% of surveys), silvereye (Zosterops lateralis; 90.8% of surveys), and common myna (Acridotheres tristis; 87.6% of surveys). Figure 3. 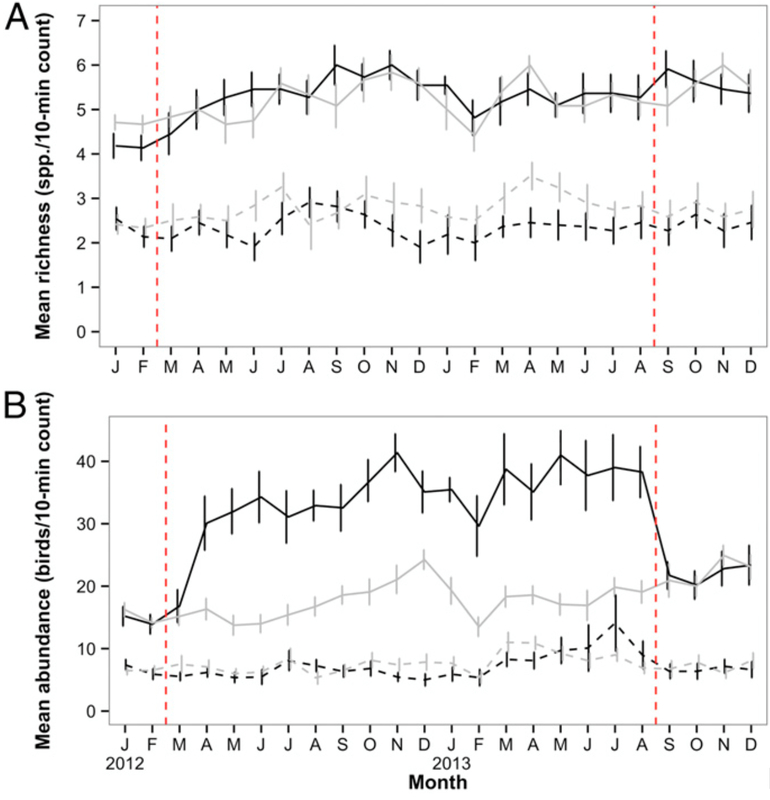 Overall (A) species abundance and (B) relative richness of garden birds recorded during 10-min point counts at urban study properties in northern Auckland, New Zealand, before, during, and after implementation of an experimental feeding regime. Key: introduced feeding (F) properties (solid black line); introduced nonfeeding (NF) properties (solid grey line); native F properties (dashed black line); native NF properties (dashed grey line). Vertical red dashed lines indicate the start and end of the feeding regime. Error bars represent SEM. (doi: 10.1073/pnas.1501489112). Illustration: Josie Galbraith. The team found that the average number of introduced species (solid lines, figure 3A) per survey was well above that for native species (dashed lines, figure 3A) for all properties for the duration of the study. Although the overall number of species present (figure 3A) for all properties did not change during this time, introduced and native species did react differently to feeding. The abundance of introduced species increased on feeding properties during the study (solid lines, figure 3B). The largest change in introduced species abundance was documented for house sparrows and spotted doves, Streptopelia chinensis. During experimental feeding, sparrow abundance increased by 2.4 at feeding sites and spotted doves were 3.6 times more abundant. Further, the team found that the abundance of spotted doves increased rapidly within two months of the start of feeding, indicating that good news travels fast amongst this species: nearby doves quickly relocated to the feeding sites. In contrast, the richness of native bird species increased on nonfeeding properties during the study (black dashed line, figure 3A), whereas native species richness remained unchanged at feeding properties (grey dashed line, figure 3A). The overall abundance of native species remained unchanged for both feeding and nonfeeding properties (dashed lines, figure 3B). The most worrying finding in this study was the correlation between bird feeding and abundance of the endemic grey warbler, Gerygone igata, at feeding sites. During the 18 month study, the grey warbler’s numbers dropped by more than half. Adult grey warbler, Gerygone igata. Photograph: Tessa Galbraith (courtesy of Josie Galbraith). Why might grey warbler abundance be so dramatically altered by bird feeding? “They typically forage on insects in the tree canopy but their ability to forage efficiently may be affected by the disruption of higher densities of other birds at feeding sites”, writes Ms Galbraith. “There is some evidence their numbers are declining anyway, so this study does add to that concern”, Ms Galbraith added. 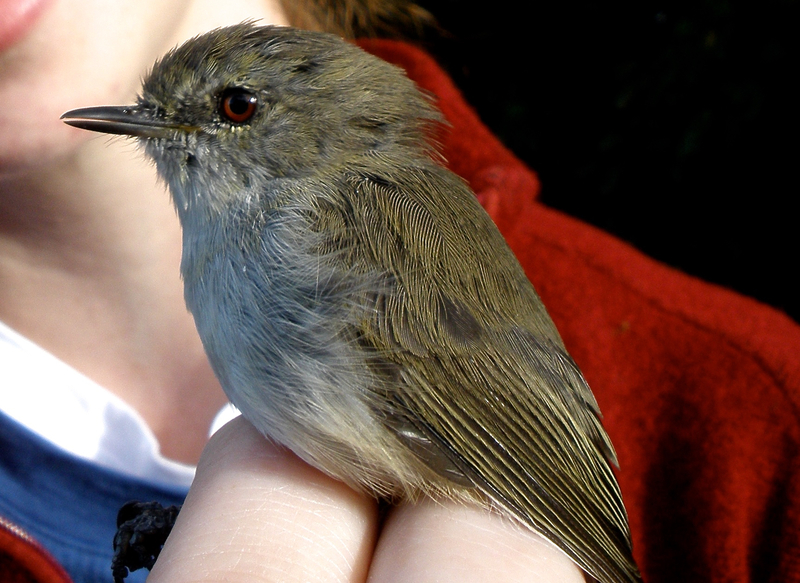 The grey warbler was voted New Zealand’s “Bird of the Year” in 2007. Adults of this diminutive songbird species have greyish-brown upperparts, whilst its abdomen, throat and breast are greyish-white with just the faintest hint of yellow. The short tail is white underneath, dark brown on top and has white feather tips that are visible in flight. The bird’s face is pale grey with startlingly brilliant ruby-red eyes. What happens to local bird communities once feeding stops? When the study ended, the supplementary bird feeding regime stopped abruptly (figure 3). What then did the birds do? “The abundance of these feeder-visiting birds decreased very rapidly after we stopped the feeding experiment”, writes Ms Galbraith in email. This observation raises one of the many questions around which bird feeding controversies swirl: were the “feeder birds” so dependent upon being fed that they starved when alternative food was no longer available? But there is evidence that feeding birds with bread and seed does have an effect on local native bird species: this study revealed significant changes in the composition of the local urban bird community as a result of feeding. Although this study was conducted at a tiny scale — just 11 households with birdfeeders, compared to an estimated 265,000 households feeding birds in six major New Zealand cities — the team found evidence that five common native garden bird species were negatively affected by the experimental feeding regime, although that effect was temporary. “In New Zealand we typically have more non-natives than natives in our cities, both in terms of the number of species and overall abundance”, wrote Ms Galbraith in email. “That’s partly down to diet — many of the non-natives are omnivores or granivores, which is perfect for making use of the resources available in cities”, Ms Galbraith pointed out. “This work certainly suggests bird-feeding favours introduced birds such as spotted doves over native birds, which mostly eat insects, nectar and fruit,” agreed co-author Margaret Stanley, who is a Senior Lecturer in the Biological Sciences at the University of Auckland. Dr Stanley is one of Ms Galbraith’s dissertation supervisors. How can people help their local native bird species? Matching the types of seed and other foods that you provide so you specifically attract local native species is important. For example, many insectivorous bird species respond well when live insects or insect larvae are provided. Other bird species will be attracted by fresh cut fruits, berries or nectars, and a variety of native seed-eating birds will show up to dine on their “special seeds”. Many bird feeders are specially designed to attract just the desired species, leaving others — the introduced species, one hopes — to search for food elsewhere. In addition to changing the types of foods provided and the sorts of feeders used, other strategies can help native birds, too. “There are also other ways of encouraging birds into our gardens, including creating bird-friendly habitat by planting a variety of native flowering and fruiting plants and trees, as well as providing a water source”, Ms Galbraith wrote in email. Other strategies that I’ve used include providing proper nest boxes (with appropriately sized entrance holes and anti-predator devices) that native cavity-nesting species will use, and providing a variety of nest materials. Like a crowded into watering hole in an arid region of Africa, a birdfeeder attracts many birds that would not ordinarily be found feeding in such close proximity. For this reason, another “birdfeeding controversy” is the very real possibility of increased disease transmission, which is exacerbated when the person supplying food does not practice good “birdfeeder hygiene”. Basically, this amounts to washing the bird feeder and all feeding tools with soap or bleach and allowing everything to dry thoroughly before putting them back into service. This entry was posted in Animalia, Birding, Birds, Birds and tagged birdfeeding, introduced species, invasive species, journal club, urban birds. Bookmark the permalink.